Jalapeño Poppers with cheese, more cheese, bacon, & jalapeños wrapped up in a soft roll, what on earth could be better than that? Oh yeah, more cheese. Layers of pepper jack cheese, cream cheese and jalapeños stuffed inside a Rhodes Rolls makes the best ever jalapeno popper. Seriously, I will never make them any other way. With so many of my favorite teams playing all weekend, I don’t want to spend my time in the kitchen. I mean between the sporting events my own kids are in, the NFL and college football Saturday I want to spend my time cheering on my favorite teams, like the Fighting Cheetahs (my son’s soccer team). My dad always made jalapeno poppers growing up. You know the ones I am talking about wrapped in bacon and stuffed with cream cheese? So I basically took that and added Pepper Jack cheese and wrapped it with a roll. Oh holy goodness. Appetizer heaven. My dad after first bite said “You are so talented.” My husband ate three before he said a word, a very good sign. And I couldn’t stop eating them. In fact, I baked them ate a few then left to get the kids from school and I was thinking about them. My stomach was even growling and I WASN’T hungry. That is how good these are. And did I mention how easy to prepare these Jalapeño Poppers are? Let the rolls do all the work, rising on the counter, then stuff them, bake them on up and you are set. 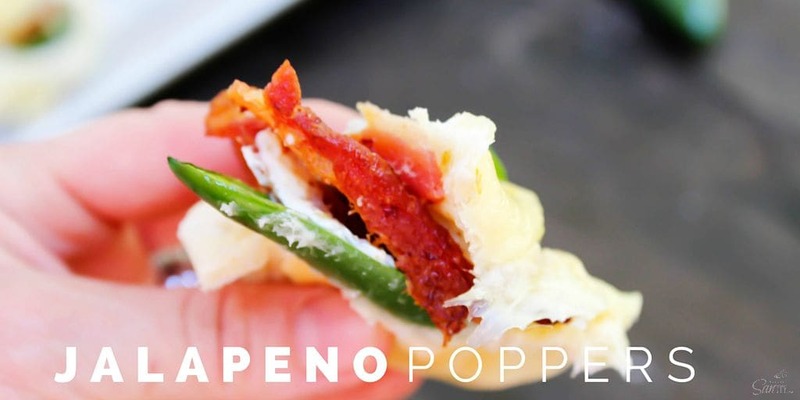 Enjoy this football season even more with these Jalapeño Poppers. Your weekend menu just got better. How do you make Jalapeño Poppers? Prepare a baking sheet with parchment paper, place rolls on the pan and allow to rise for 2 ½ – 3 hours. While the rolls are rising cook bacon and prepare jalapeños. Cut 8 of the 9 jalapeños in half, remove stem and seeds, then stuff with cream cheese, set aside in the fridge until ready to assemble rolls. Cut the pepper jack cheese slices into quarters, set aside in the fridge until ready to assemble rolls. Once rolls have risen, cut them in half, like pictured. So this one at a time, cutting in half but not cutting all the way through, as pictured. Stuff rolls as directed below. Then move on to the next one, do not cut them all in half at the same time. Place one jalapeño half cream cheese side up on the bottom half of the roll. Take one piece of bacon, break in half and place the two halves on top of the jalapeño. Top the bacon with 2 quarters of Pepper Jack cheese. Take the top half of the roll and pull it over the jalapeño, bacon, and cheese. Pinch the top and bottom together and pull the seam underneath the roll, so that the pinch/seam part it under the roll while it bakes, making sure it doesn’t come apart while baking. Place back onto parchment paper on the pan. Preheat oven to 350 degrees. Prepare the remaining rolls. Place pan in the oven once all of the rolls are complete and bake for 16 minutes. While rolls are baking slice the remaining jalapeño. Remove from oven and place 2 quarters of Pepper Jack cheese on top of each roll and one jalapeno slice. Place back in oven and bake until cheese is melted about 3-4 minutes. Remove from oven and serve immediately. Be careful they will be hot. They serve well at room temp or even cold too. Enjoy! SHEET PAN: I love using a larger sheet pan while cooking because I am feeding my family of seven. Start with this 13 by 18 half sheet pan. I love these pans so much that I have 9! If you love this recipe, be sure to try my Jalapeno Popper Mac & Cheese, Jalapeno Popper Breadsticks, and Skillet Jalapeño Popper Dip. Jalapeño Poppers with cheese, more cheese, bacon, & jalapenos wrapped up in a soft roll, what on earth could be better than that? Oh yeah, more cheese. Prepare a baking sheet with parchment paper, place rolls on the pan and allow to rise for 2 ½ - 3 hours. While the rolls are rising cook bacon and prepare jalapenos. Cut 8 of the 9 jalapenos in half, remove stem and seeds, then stuff with cream cheese, set aside in the fridge until ready to assemble rolls. Place one jalapeno half cream cheese side up on the bottom half of the roll. Take one piece of bacon, break in half and place the two halves on top of the jalapeno. Top the bacon with 2 quarters of Pepper Jack cheese. 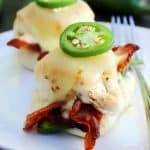 Take the top half of the roll and pull it over the jalapeno, bacon, and cheese. Pinch the top and bottom together and pull the seam underneath the roll, so that the pinch/seam part it under the roll while it bakes, making sure it doesn’t come apart while baking. Place back onto parchment paper on the pan. Place pan in the oven once all of the rolls are complete and bake for 16 minutes. While rolls are baking slice the remaining jalapeno. Total time includes 2 hours for the rolls to rise.